Tim Curran, you’ve been relatively prolific over the past 20 years. When did you first realize you might want to be a writer? I wrote my first story when I was in seventh grade. It was a horror story about a hardboiled detective who learned that gangsters were using zombies as hit men. It wasn’t very good, but I had fun writing it. I think the plot came as the result of watching a lot of film noir and spending Saturday afternoons with those Grade-Z Monogram flicks with Bela Lugosi. I wrote sporadically for years, but I didn’t really get serious until I was 27 or 28. I always have trouble answering this one. I like everyone from Gary Braunbeck to James Herbert, Thomas Ligotti to Matt Costello. I have wide-ranging tastes in horror. One week I’m into M.R. James and the next it’s Charlee Jacob. But as to who has actually influenced me, probably everyone. Speaking of your wide-ranging taste in horror, you’ve written Fear Me, The Underdwelling, Puppet Graveyard, and the forthcoming novel Long Black Coffin for DarkFuse, and they’re all very different books. What central themes do you like to explore? I like putting characters in isolated situations where they have to rely on each other to survive. The psychology of isolation and interpersonal relationships undergoing high, life-threatening stress really gets my blood pumping as a writer. At first glance, Puppet Graveyard does not seem to be that kind of story at all. But at its core, it is. My protagonist is very much isolated…by fear, by unreality, by her own disbelief. How did Puppet Graveyard come about? Put simply: ventriloquist dummies freak me out. The typical vent dummy thing is the splintering of the ventriloquist’s personality. It’s been done again and again. But the real scary thing is the dummy itself. That’s the true seed of horror in this type of tale so I went after that aspect. The ventriloquist is secondary; the dummy is the real monster. You’ve written some terrifying scenes over the years, so let’s turn the tables. What book frightened you the most? That’s easy—The Hot Zone by Richard Preston. There’s things in that book that even made me cringe. The scariest part of it is that it’s perfectly plausible. Do you consciously set out to write dark fiction or does it just sort of happen that way? I don’t think you pick subject matter, it kind of picks you. Case in point. My wife and I were driving through Wisconsin taking a “shortcut” through the middle of the state. We kept seeing all these ruined farmhouses with overgrown pastures. As we passed one that was surrounded by wildflowers, she remarked what a beautiful photo it would make. I wondered why it was abandoned and what might walk the farmhouse after dark. When an idea like this comes to you, do you stop what you’re doing and start writing it down immediately, or do you follow a strict schedule? I’m very strict and very disciplined. I write three hours a day, every day, with very few exceptions. On the weekends I’ll put in five or six, if possible. I look at writing like playing piano or painting—if you don’t do it consistently every day, you’ll never really be any good at it. It takes practice to develop a pathway between your brain and fingers. If “writer” wasn’t an option, what would your ideal career be? I would have loved to be an artist. One of these guys who hangs around sidewalk cafés all day like Gauguin, paints in the evening, gets roaring drunk at night…then takes off for the tropics and spends the rest of his years painting natives and palm trees. It may sound like I’m trying to be funny, but the stereotypical artist/beach bum/barstool philosopher lifestyle appeals to me…no structure, no responsibilities, lots of time to dream. Any tips for up-and-coming or unpublished writers? I suppose it hardly needs to be said, but read everything. In and out of your genre. Good writers and bad ones. They both teach you things. And write, write, write. 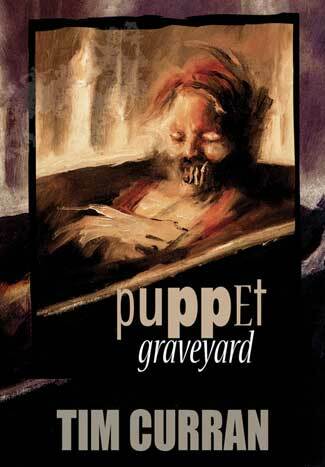 Tim’s latest release Puppet Graveyard will be available in eBook on August 21, 2012. Read more about it at the DarkFuse Web site.